providing monitoring of mission fulfillment and rendering assistance to the subordinate forces. Troop control is accomplished by the commander personally or with the staff, deputies, and chiefs of arms and services, chiefs of special troops and services, and in accordance with orders, directives, and instructions from the higher commander. The basis for troops control is the commander's decision. In accordance with the commander's decision the staff organizes and directs all measures for preparing troops for completion of the mission and directs them during the course of the operation. The commander is responsible for making the decision. He answers personally for effectively using all subordinate forces and properly achieving the results required in the mission. vigilance and activeness of control - In contemporary conditions the high maneuver capability of forces has increased and the combat situation quickly changes. The rapidity shortens the time element. The struggle to gain time in order to overtake the enemy in conduct of actions has a deciding influence on the outcome of the battle. Therefore special attention on the part of the control organs must be paid to the need for activeness and vigilance. the expansion of the volume of troop control and requirement for resourcefulness - The capabilities, qualifications, and extensive experience of commander and staff in making rational and correct decisions, quickly issuing missions to subordinates, and taking the best measures with the aim of all around support of the operations (battle) are important requirements. higher combat readiness of command-posts and troop control system at all levels (echelons) - The timely preparation and deployment of a strong control system starts at front and goes down to the company and platoon levels. Higher combat readiness is required of all control points and all signal systems and systems of data collection. They must scientifically analyze data and issue deductions about situation data quickly and correctly. reliability (continuity) of control of forces - This is provided by thorough awareness and correct understanding of the situation on the part of the commander and staff, by their capability for forecasting likely changes in the situation; by insuring reliable and continuous communications with subordinates; for timely relocation of control points moving forward with the forces; and by constant exchange of data among the staff and higher and lower forces. firmness (strength) and strong control of forces - This is making the decision and putting it into practice with the aim of fulfilling the given mission. This requires great perseverance, high morale, exactitude, and strength of commander and staff in executing the decision and a strong will in the face of difficulties. It is shown by the constant influence of the commander and staff over their subordinates and forces, by their rendering assistance to subordinates for accomplishing missions, and by inspecting the execution of missions. flexibility of control - This is insured by the great capability of the commander and staff in quickly influencing newly arising situations and in their making alterations in previously made decisions or making new decisions in answer to new situations. They also constantly inspect the execution of the assigned mission. The commander and staff must collect new data on the situation, analyze it, and quickly and correctly respond to the situation by taking needed measures. centralized troop control - This is unity of the actions of subordinate forces and concentration of their actions according to a unified plan, in order to achieve the general objective of the operation (battle) as defined by the higher commander. Various types of forces and different kinds of combat equipment participate in combat actions spread over a large region. This demands unity and centralized control and concentration of all arms and means with the aim of accomplishing the general mission. limiting the number of individuals who are called on to participate in preparation and planning of operations (battle). The Soviet officer selection system looks for dedicated communists who are aggressive, tough, stubborn, and with a personality to be a combat leader in command positions for promotion. Senior commanders (army and above) owe their positions to personal politicking, favoritism, cronyism and party loyalty. The senior positions are all under the system of appointments within the "nomenclature". Not all commanders are intellectuals but all have attended the vigorous studies at the Voroshilov Academy. In practice the army commander depends on his staff for the quality of his planning. Staff officers are career specialists who are academically inclined and well versed in Soviet terms. They too are taught to follow "the book" and think in terms of norms and formulas. The chief of staff is the key individual at headquarters. He advises the commander during the initial decision process, plans the planning process, transmits the commander's guidance to the staff, supervises the planning and recommends the selected course of action to the commander. The commander always has the final word on a plan. But generally he will accept the plan proposed by the chief of staff. The commander actively supervises the headquarters, makes personal field reconnaissance, and keeps fully informed of all details. The commander and chief of staff must think and act in unison. They share a common perception of the unit mission and concept of the operation. The chief of staff is also the principal first deputy commander and the only one authorized to act in the commander's name. The other first deputy commander is concerned primarily with training and combat effectiveness. The Soviet social system stresses the importance of prerogatives associated with each position. Thus the interpersonal relations of commander and staff will be very formal in most cases. Soviet officers are expected to perform according to rigorous standards. Staff officers will be trained to perform one specific functional duty very well but may be cross-trained into another. In addition staff officers will be assigned specific extra topics to study, such as mountain warfare. The Soviet system establishes close direct ties between staff counterparts at each headquarters up and down the line. Thus, while the commanders are passing combat orders the staff sections will be in communication discussing their particular parts of the operation (battle). The commander cannot change his mission without approval from higher headquarters. In his various reports to headquarters he must state his decision at the time and may make suggestions for future action, which might include changes to the original plans. He may change things within his division such as the allocation of his artillery. He could not change the fire plan of a supporting army's artillery without first receiving permission from the army chief of artillery and rocket troops, as such a change might affect the army plans. The division commander may ask adjacent divisions for permission to send forces through their zones in a maneuver, but this also should be cleared at army level. The main thing is that the division commanders (all commanders) know the CONCEPT OF THE HIGHER COMMANDER and stick to performing their role in it. As long as he keeps in the framework of the higher commander he can do as much as he pleases or is required. If communications are cut, he will continue to follow this concept and be as aggressive as possible in the situation. Courses of action available to overcome difficulties include: (l) a call for help; (2) request artillery or air support; (3) commit reserve; or (4) regroup forces. How much initiative is allowed to the army commander and staff? The front commander and staff will let the army commander do what he wants...as long as the front does not know about it. If the front staff does know about it, they will usually have an opinion on how to do it and will say so. If the army suggests doing something the front did not already know about or specify, the front will generally say "fine that is the way we would like to do it"; the idea being to preserve the appearance of the front being in charge and not let the subordinate think he is getting away with anything. There is massive mistrust throughout all echelons of the Soviet military just as there is in civilian society at large. No one trusts anyone in reports; cheating is expected. No one relies on promised support and, in fact, everyone is admonished to do their job without expecting, relying on, or receiving support. Commanders expect that if they do not do things themselves they might be betrayed. The chief of the political department of each staff, while not being able to give much advice, will be reporting and will try to ensure reports are not falsified. The question frequently raised is, "How much independent action is allowed to Soviet commanders in making decisions involving changes to plans and would they really take such action?" The answer lies in a consideration of the mission. The mission must be accomplished in, by, and at a certain time. Any initiative on the part of commanders can be supported if it will help achieve the mission including its time element. If the change is major, and especially if it involves a different time, the commander will send a representative to higher headquarters to obtain authorization for the change. If the army commander wants a change in the plan, he must obtain the permission of the front commander; and, if the latter wants a change, he must get TVD or general staff approval, as such a change will involve the higher headquarters and may force changes in the overall plan. The front commander alone cannot make such a decision. If the mission is not affected, then he can make changes, but even then he would have to be very cautious. The highest credit goes to people who do as ordered despite all obstacles. There is always a psychological relationship between the commander and his superior commander. It may be that the higher commander is so dependent on his staff for making his plans that he cannot easily evaluate the proposal of the lower commander. Rather than show this, he will let it become clear that he does not appreciate proposals for changes. Some commanders will do their utmost to avoid making changes just to appear firm and decisive. Unless the situation is serious, and the consequences of not changing dangerous, the subordinate commander would have to know if his boss does in fact like to hear proposals for changes before he would offer any. Only a commander with a very strong personality could accept suggestions from subordinates to change. The Soviets consider the headquarters to contain six basic elements. These are the commander, the staff, the political section, the special (counterintelligence) and legal sections, the sections of the chiefs of arms and services, and the section of the chief of rear services. This organization is shown in the following table. The term command is defined by the Soviets as the person or group of persons exercising direct command control of the troop unit. There is also a secondary command system for the various special elements of the Soviet headquarters. The command is the element of the headquarters which not only has primary responsibility for overall success or failure, but also for direct personal control of troops during all phases of a combat action and for their training prior to combat. At various levels the organization of the command will vary. The following is a typical command organization for the division and army headquarters. 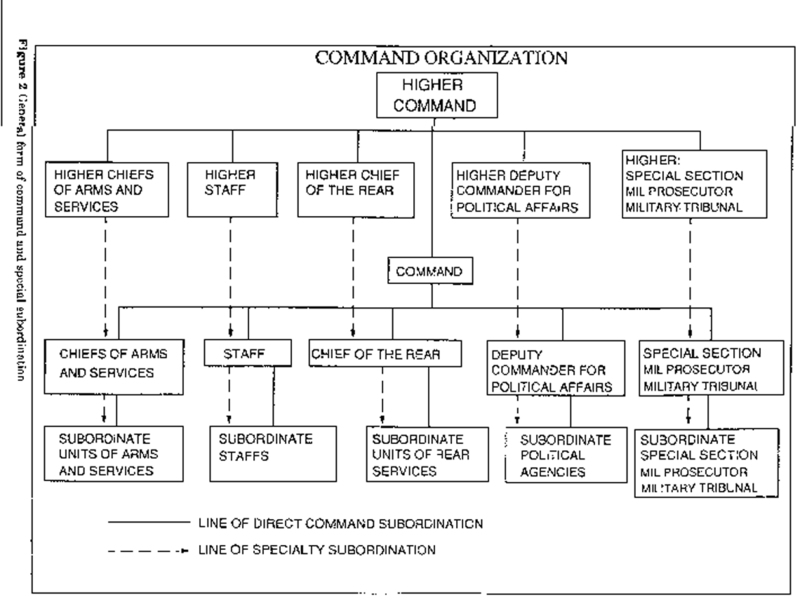 In addition to the command chain of command there is a special functional chain of subordination directly between the chiefs of combat arms, special troops, and services and rear and their counterparts above and below. This dual subordination plays a key part in the promolgation of orders and instructions as will be shown in subsequent chapters. This complex arrangement is shown in Figure 2. Axis officers are used as an auxiliary means for troops control and communication between headquarters. There are two types of axis officer. The first type, capped "command axis officer" is assigned from higher to subordinate or adjacent headquarters. The second type, called "axis officer", is assigned from subordinate or adjacent headquarters to the liaison group in the higher headquarters. Axis officers are selected by the chief of staff from the major staff sections including operations intelligence communications and usually work as a group with the higher operations section. Their duties include: reporting to the higher staff as required the current enemy situation in the subordinate unit's sector; reporting the tactical situation of the subordinate unit and the decisions of the unit commander, the chief of staff, and the chief of the operations section; reporting to the subordinate staff, as directed, information from the higher staff concerning the enemy situation, tactical situation, and decisions of the higher commander; sending timely warning to the axis officer's unit concerning impending missions and ensuring prompt delivery of all orders and directives from the higher headquarters. The Soviets emphasize the extreme importance for the proper functioning of the headquarters that it be correctly echeloned, arranged, and equipped. The site must be carefully selected and skillfully camouflaged. Movement from one site to the next is carefully planned by the staff and prepared for by special engineer and signal units. The main components of the command post are the commander's command center, the operations group, the communications center, and the service group. Depending upon the terrain, the command post is arranged generally as indicated in figure --. Dugouts, covered shelter trenches, open trenches, and weapons emplacements are all used to shelter command post personnel and installations. The command post operations group is composed of those officers and staff sections directly concerned with the direction of combat operations. These include: the commander, deputy commander, chief of staff, operations section, intelligence section, topographic section, communications section, cryptographic section, artillery commander and staff, chiefs of arms and services and staffs, a staff officer from the rear service area, liaison officers, and the staff duty officer. The communications center includes the installations and units primarily concerned with providing communications for the commander and staff with higher, lower, and adjacent headquarters. The commander of the signal unit is the director of the communications center. All units servicing the communications center are subordinate to him and he in turn is subordinate to the chief of communications at the headquarters. The communications center includes the radio center, central telephone-telegraph station, landing strip and air ground communications point, message center, and reserve communications supplies and personnel. The all around protection of the command post area is provided by organizing a guard system and a defense system. In combat, the command post is located in an area which is protected from ground attack by the troops of subordinate units and from air attack by the unit's air defense units. However, the command post also plans its own guard and defense systems. This planning is accomplished mainly by the operations section, and execution of the plan is supervised by the headquarters commandant. In addition to personnel from the headquarters commandant unit, staff personnel also participate in the command post defense, especially in the event of an enemy breakthrough. In this case, the guard and defense system is often reinforced with small infantry, artillery, and engineer units. An important part of the command post administrative organization is the duty officer system. In order to assure continuity of the command post work, to provide rest for the command and staff personnel, and to facilitate the sending and receipt of messages and documents, duty officers are appointed to vital command post positions every 24 hours. The duty officer system includes the operations section duty officer, the communications duty officer, and the message center duty non commissioned officer. Soviet regulations provide general norms for the location of command posts under various conditions. Commanders must locate themselves as far forward as possible in order to exert personal control of the most important combat actions. The following table indicates the approximate distance from the front lines to the forward and main command posts and the rear service control point. These distances are subject to considerable change owing to varying circumstances in combat. The command posts are displaced in a planned, orderly manner in order to remain within prescribed normative distances from the advancing troops. The formula for determining how long a command post may remain in one location in relation to the rate of advance of the front line is given in Chapter Six. The essence of offensive battle is to hit the enemy with heavy fire of all types of weapons, (including nuclear weapons when used); to attack resolutely and relentlessly, moving continuously attacking troops into the depth of the enemy dispositions to seize and destroy his personnel, weapons, and combat equipment; as well as to capture important areas and lines in the depth of the enemy defenses. The aim of offensive battle is achieved through a combination of heavy fire of all types of weapons; forceful blows by tank and motorized rifle formations, units, and subunits to an extended depth in cooperation with the air forces; use of extensive maneuver of fire, troops, and means on the battlefield; and aggressive support by radio-electronic combat. The aim of offensive battle for ground forces is to destroy specific enemy groupings at a certain time and seize favorable lines and areas in the depth of the enemy defenses. The inherent components of offensive action consist of fire, blow, maneuver, and radio-electronic combat. Fire provides the possibility to insure the neutralization of the enemy and provide favorable conditions for the enemy's destruction by a blow of tank and motorized formations. In a nuclear war the principal element of firepower is the nuclear strike, while in a conventional war firepower is based on artillery and air force strikes. It must be noted that a defending enemy can also fire to destroy the attacking forces by means of fire, therefore an intensive fire duel ensues during the battle. In order to establish a superiority of fire over the enemy, the attacking troops can be supported by such an amount of artillery which will establish a favorable correlation in terms of artillery for the attacking troops. It must also be noted that the attacking forces, when in the depth of the enemy area, will have to relocate their artillery more frequently that the defending troops; therefore, an appropriate superiority of artillery over the enemy should provide conditions for the establishment of sufficient artillery support for the attacking troops during all phases of an offensive battle. The blow is a combination of fire with the movement of tank and motorized rifle subunits, which leads to the complete destruction of the enemy or his capture and seizure of favorable lines in the enemy's defenses. The blow is actually fire of machine guns, guns, automatic rifles, and other small arms mounted on tanks, BMP's, APC's, and other vehicles or used during movement in direct contact with the enemy or used by dismounted infantry during the assault. Its nature is based on the fact that it is fire on the move in direct contact with the enemy. In other words a blow is assault or counterassault. Maneuver provides favorable conditions to launch blows against the enemy and fire effectively on the enemy. Maneuver enables the troops to get into a position from which they can effectively attack the enemy or launch a counterattack or deliver effective fire against the enemy. Maneuver also is conducted to move the troops quickly during the advance in depth, and to outflank the enemy dispositions. Maneuver can be conducted by fire, troops, and means. The principal forms of maneuver at the tactical level are envelopment, deep envelopment, and penetration. When the envelopment of the enemy is not feasible, its defenses are attacked using the penetration method. The role of penetration is to create gaps in the enemy defenses by destroying its personnel and equipment by fire, to move the attacking forces through the entire tactical depth of the enemy defenses with simultaneous expansion of the attack to the flanks, and further development of the attack to the depth. The action of the troops in a penetration is of the nature of maneuver. The troops continuously seek gaps and openings in the enemy dispositions to conduct envelopment, and deep envelopment which will lead to the encirclement of the enemy grouping. quick restoration of the combat capability of the troops. The principal difference in offensive combat with the use of nuclear weapons from combat without their use is the fact that in a nuclear combat the enemy's defenses are destroyed simultaneously and the action of the troops is coordinated in a way to quickly exploit the impact or consequences of the use of nuclear weapons, while in a non-nuclear situation the enemy is destroyed successively with the action of the troops coordinated with artillery fire and air strikes. The offensive operation is conducted under various kinds of conditions and in different situations depending on the enemy, terrain, time, season, weather conditions, and tactical situations. The attack can be conducted against a deliberate defense or a hasty defense. It can be conducted in an open terrain, mountains, deserts, etc. It can be launched during the day or at night and in various seasons and types of weather, such as arctic conditions and tropical climates. All these conditions will have influences in one way or the other on the missions of the troops, combat formations and groupings of troops, and methods of coordination and initiation of the attack. Generally speaking, the attack can be initiated either from the line of march or from a position in contact with the enemy. Each of these forms will have other variations depending on the tactical and operational situation. Each form has its advantages and disadvantages. For example, the attack from the line of march, being the principal form for the initiation of the attack in modern times, provides a surprise blow to the enemy by the movement of the troops from the depth to concentrate them for a penetration. It also precludes the concentration of large groupings of forces in close contact with the enemy for longer periods of time and prevents the enemy's reconnaissance from locating all targets of the attacking forces well in advance. This also cuts the volume of engineer work to provide cover for the troops concentrated in direct contact with the enemy. The disadvantages are the requirement of sufficient road network for the movement of all types of troops for the attack during the artillery preparatory fire period, which may not be available in some mountainous terrain; absence of conditions for the troops to study in detail the enemy's defenses sufficiently before the attack; and requirement for strong air cover to protect the troops during their advance to the assault against enemy air strikes. While in WWII, when the firepower of the divisions had not sufficiently developed, the principal part of the attack against a prepared and fortified enemy defense was from a position in close contact with the enemy and against a hasty enemy defense was attack from the line of march; the situation has changed today. Now the improvement and increase in firepower in the division and the high maneuverability of the troops makes it possible to attack a prepared and even fortified enemy defense from the line of march. In this case the troops move from the depth during the artillery preparatory fire to the assault line; and, while the enemy is suppressed by artillery and air force, the troops successively deploy into battalion, company, and platoon columns and finally deploy for the assault and initiate the assault without pause. During this advance, the line of deployment to battalion columns is selected to be out of range of the main enemy artillery groupings. The preparatory fire for the attack normally begins when the troops reach this line. In other words the distance of this line from the enemy FEBA can be eight to ten kilometers. The line of deployment into company columns is selected to be out of range of enemy antitank guided rockets and tanks and guns conducting direct fire. In other words it is currently three to four kilometers from the FEBA. The full deployment line (combat line) is selected to be behind the last sheltering terrain feature or one kilometer from the FEBA. This can also serve as an assault line in an attack in mounted attack. In dismounted attack the assault line is selected as close to the enemy as possible and also a line of dismounting is selected. When the attack from the line of march is conducted against a prepared defense, the attacking troops will occupy assembly areas to prepare the attack in areas located out of range of the enemy tactical rockets and long range artillery. In the course of the offensive operation the preparation for the attack against a hasty defense line is conducted while the troops are still moving toward the line, so they can launch their attack without stopping. In cases when the attack on the move from the depth is not successful, the attack is done after a brief preparation. This preparatory time is 2-3 hrs for regiment, and 4-6 hrs for division, during which artillery preparation is conducted and adjustments in groupings are made, while further reconnaissance of the enemy is continued. When the troops move from the depth to attack the enemy prepared defense, artillery groups, part of the direct fire weapons, part of the air defense troops, and control points move in advance to the starting (departure) area. The artillery should be moved early, to be prepared to fire two to three hours before the beginning of the attack. The attack from a position in close contact with the enemy can be conducted either from the defensive positions or after the relief of troops in place. In the first case a regrouping is required as part of the preparation for the attack, while in the second situation a relief in place is organized and conducted prior to the attack. In either case the troops thoroughly study the enemy defensive dispositions and organize the attack on the ground. In order to decrease the effects of enemy fire on the troops during the preparation of the attack, the time of concentration of the troops should be cut and shelters and cover should be provided in the departure areas for personnel and equipment. 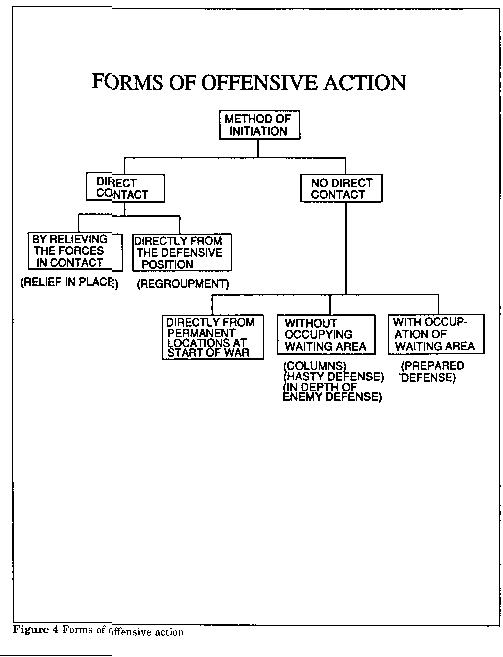 (The various forms for offensive actions are shown in Figure 3). By the same token attack from the position in close contact with the enemy has its advantages and disadvantages, which will correspond to the opposite factors mentioned with respect to the attack from the line of march. A squad, platoon, and company have immediate missions and a direction of attack. A battalion and regiment have immediate and subsequent missions and direction of attack. A division has immediate and subsequent missions. The army has immediate and longer range missions. The latter is the final mission of the army operation. The front has immediate and longer range missions. The second-echelon has only an immediate mission and a direction of attack. Attachment, or under command, is the closest form of support. The attached unit comes under the direct command of the unit to which it is assigned and is treated like an organic unit. The senior commander has full choice on how to utilize this unit. When a unit is attached, its commander reports to the senior commander on the situation and capabilities of the unit. The unit is moved according to the orders of the senior commander. Sometimes (usually not in the operations order itself but in the coordination instructions) the units are listed telling when they will be detached and moved to other units. This is especially true for the commitment of the second-echelon unit. At that time a number of supporting units will be detached from a first-echelon unit and moved into the second-echelon with the time and place of the attachment clearly spelled out. As the second-echelon unit approaches the line of commitment it receives its new attachments. When a unit is in defense and a counterattack is planned, the coordination instructions will mention which units are to be attached. A unit that is attached still receives its rear service support from the parent unit, but the responsibility for supplies rests with the unit to which it is attached. An attached unit can include artillery, tanks, engineers, signal, chemical, antitank, antiaircraft, etc. A division could have 4 or 5 or more artillery battalions attached from army, while a regiment in the main attack will have 2 to 3 artillery battalions attached. The headquarters of a division or army artillery regiment may also be attached to form a headquarters for the regimental artillery group. The regimental chief of artillery is responsible for all artillery fire in the regiment command therefore disqualifying him as a commander for a regimental artillery group (RAG). The RAG is then commanded by either of the battalion commanders or a headquarters brought in for the purpose. There are several reserves including the antitank reserve and the mobile obstacle detachment. There are special reserves such as engineer, signal, and chemical. The engineer reserves are used for employment in engineer roles, not for use as infantry. The Soviet view is that combat is a process, a two-sided dynamic process, which takes place in a given space and time period and with given inputs. The Soviet commander's purpose is to control the output or resolution of the process in a way favorable to himself. The process is a series of actions, reactions, and counterreactions extending throughout the specified space over the period of time. The time and space variables are themselves subject to control, as are the Soviet input and actions. In addition, the Soviet planner and commander believe it is necessary and possible also to control the inputs and actions of the opponents, or at the very least to anticipate them and prepare accordingly. Soviet planners have studied the history of combat actions, conducted experimental exercises in field maneuvers, and developed a theory which links the time and space parameters with the forces of the two sides engaged in combat. The theory forms the basis for structuring the Soviet forces and deploying them with missions corresponding to their capabilities to defeat the enemy forces to be encountered in the defined action, and to generate a momentum in their attack which will grow rather than diminish over time, as the Soviet force moves deeper into the defender's area. A unit has a certain capability based on the correlation of its power versus the opponent. The initial mission is assigned to insure that the superiority of the force enables it to accomplish the mission in a certain time period. Analysis is made of the defender's dispositions and possible courses of action. Basically there are two courses for the defender for the use of the reserve. One is to hold in place and the other is to counterattack. If the counterattack is to succeed, then it must be launched at a certain time and place in order to be effective and must have a certain force available to overcome the attacker. By careful analysis of the defender's situation the Soviet attacker can predict the most probable time and place for the potential counterattack. In the initial attack the battalion attacks the defending company in the first-echelon of the defending battalion. For this it uses its two first-echelon companies, which give it a 2 to 1 ratio over the defender. The attacking battalion can overcome this defending company and move into the depth of the defending battalion position. Now the defender must decide on committing the second-echelon company. In order for it to restore the situation it must attack before the first-echelon company is overrun, otherwise it is too late. In general the Soviets do not believe a defending battalion can launch a counterattack with this second-echelon company because there is not enough time, the space is to small, and the force ratio is adverse to the defender. The defender is better off keeping this company in position in defense. In any case the attacking battalion uses its second-echelon company plus the remainder of the two first-echelon companies to attack the defending second-echelon company or battalion reserve. Meanwhile, the adjacent first-echelon battalion of the attacking regiment is attacking the other first-echelon company of the defending battalion. Thus, when it also moves into the depth of the battalion defense it also confronts the same second-echelon company being confronted by the other battalion. Thus it is clear that the attacking battalions can overcome the defending battalion and keep up the momentum of their attack to their initial mission depth. At this time the defender can intervene with a counterattack by the second-echelon battalion of the defending brigade. This is actually the first real possibility for counterattack open to the defender. This counterattack must be launched before the first-echelon defending battalion is overrun. This counterattack is capable of slowing the momentum of the two attacking battalions or of stopping one of them. Therefore, the attacking regiment determines where this counterattack would logically come and prepares to delay it, or stop it, or overcome it with its own second-echelon battalion. The attacking regiment plans for the commitment of its second-echelon battalion at the time and place that will carry the momentum of the attack further into the defender's depth, to the line of the subsequent mission of the regiment. The division establishes its immediate mission at the line which the first-echelon regiments are capable of attaining unaided. In order to increase the momentum and achieve its long-range mission, the division plans to commit its second-echelon regiment at about the time the first-echelon regiments attain their subsequent mission (division immediate). The division also recognizes that it is at about this time in the combat that it will most likely have to contend with the counterattack of the defending division reserves. The division mission is given on a daily basis. Thus its planning is done for a day of combat at a time. In accordance with this concept the division daily plan provides for the full day's actions of the division as it seeks to fulfill its immediate and long-range missions on time. The division plan gives detailed immediate and subsequent missions to the first-echelon regiments, which start the day's fighting, and an immediate mission to the second-echelon regiment, which is planned for commitment part way through the day. The first-echelon regimental plans give detailed immediate and subsequent missions for their first-echelon battalions and an immediate mission to their second-echelon battalions. All these plans are developed for specified time and space dimensions within which the Soviets believe they can predict the outcome of the combat. It should be noted, for example, that the second-echelon regiment does not give missions to its battalions until later in the day, when the exact dimensions of its task are more clear. Nor does the initial combat order contain the missions which the first-echelon battalions of the first-echelon regiments will receive later in the day, when they have accomplished their part in the regimental initial attack. The important concept to understand from this is that, while the division creates a daily plan and has in this sense a daily decision and planning cycle geared to produce a new plan for each day, it also is engaged in continuous decision making and planning throughout the day as it constantly responds to the requirements of the unfolding battle. In the Soviet view the division is the highest tactical formation. Its daily activities are in the realm of tactics. The army and front are operational formations whose activities constitute the essence of operational art. Operations of the army are planned and conducted on a larger scale of time and space than those of the division, but in theory they are structured in a similar manner. The first-echelon army is given an immediate and a long-range mission for its first operation, which corresponds to the front initial (immediate) mission. The missions the first-echelon army will perform in its second operation, during the achievement of the front further mission are not given. The second-echelon army is given an immediate mission corresponding to its line of commitment planned for two to three days into the front offensive, but not a subsequent mission. Thus the scale of combat governs the time and space dimensions of the unit's battle and the duration of its plan. A battalion battle normally lasts for two to three hours, for which time its probable actions can be forecast. Its plan accords with this. The regiment battle lasts for five to six hours, during which its actions can be forecast and planned for. The division battle lasts for a single day, as does its plan. Armies fight operations lasting 5-7 days and fronts conduct operations lasting up to 15 days. (The following tables summarize Soviet norms for missions and expected counterattacks). The calculated breakthrough frontages for units are 1 km for battalion, 2 km for regiment, 4 km for division, and 8-10 km for army. The breakthrough sectors for a front may be twenty-seven to thirty kilometers. The breakthrough for a front is not the sum of the breakthrough sectors for first-echelon divisions, since there will be many divisions not operating on the front's main or secondary axis, which nevertheless have their own breakthrough sectors. Soviet planners have norms for expected rates of advance in various conditions and for comparing forces in the correlation of forces and means calculations. Under usual conditions they expect the rate of advance to be 25-30 km the first day of an offensive for the main axis in a standard defense situation and 60-70 km per day on subsequent days. If the defense is well fortified then the rate of advance the first day would be 15-20 km and subsequent days 30-50 km. In order to achieve this they would require a two to three times superiority over the defender. If the ratio (correlation) of forces and means were only between 1 to 1 and 2 to 1, they would plan conservatively and expect a slower rate of advance. If the ratio were over 3 to 1, then they might hope for a 40 km advance on the first day. Since the rate of advance depends on the type of defense, they might expect a higher rate of advance even at two to one against a weak or hasty defense. The nationality and training of the forces involved also is a factor which can be considered in the estimate. The Soviet planner thinks about the actual situation confronting him in terms of pluses and minuses from the standard norm for standard conditions and judges accordingly. If too many minuses show up he becomes very careful and conservative. He would begin to think about committing the reserves earlier or if the situation appeared extra favorable, he would think about committing the reserves later. Soviet planners discuss the qualitative aspect of forces and means when considering the correlation calculation. By this they mean that correlations should only be considered between items of like quality. They do not compare different weapons systems having radically different quality or lump together items of different quality. The norms for density of artillery relate to caliber and compare equivalent weapons. For tanks they calculate the probability of kill for comparable tanks such as M-60 versus T-55 or how equivalent is a T-62 to a Chieftain etc. When comparing units they take into consideration the size. If there is a great difference in size, they multiply by a number that will bring some equivalence into the equation. For instance they do not compare a company of 100 men with one of 160 but multiply by a factor to bring the two into relative equality. The extent to which the Soviet commander and staff rely on numerical calculations to give them a sense of impending failure is often exaggerated in Western literature. It is true that Soviet officers perform far more numerical calculations than Western officers would, but they are not rigidly tied to these. They do not give up just because the numbers appear adverse. Initiative is emphasized in the Soviet sense, which means determination to overcome difficulties. Figures do not override judgment or cause collapse of morale. If the correlation suggests that superiority cannot be gained on a given axis at a given future time and place, then that is a signal to correct the plan for the situation. The commander should consider moving in a different direction, using a different organization or some other method to regain the balance/correlation calculation that he desires. Even if the correlation of forces indices are not favorable, the commander must come up with some plan to stop the enemy counterattacks. While this plan may have to be approved at a higher level, the Soviets believe that officers who plan in the face of difficulty or do something even if it turns out wrong later are preferable to those who do not try to identify any alternatives. Definition of "Forces and Means" in "Correlation of Forces and Means"
The term, "forces", refers to the human element in organized combat units of organized fighting structures of combined arms. Non-combat units, e.g., engineers, etc., are not counted in the correlation of forces. In calculations of the correlations at the tactical level, the unit two steps lower than the command doing the assessment is taken as the unit to be measured. For instance a division would calculate the correlation of forces of battalions. At the operational level and strategic level divisions are the subject of the correlation of forces analysis. All other elements being correlated are "means". These are the hardware or firepower generating elements such as numbers of artillery pieces, launchers, nuclear warheads, aircraft, tanks, etc. (Tables for recording correlation data are given in chapter 5). The correlation of forces alone does not show the means. Both are important. To consider, for instance, only battalions without reference to the type of weapons they are armed with is to obscure very significant differences. In particular such specific means as air defense weapons and antitank weapons are very important. But for the others, specific coefficients are attached to each type of weapon. These coefficients are based on detailed studies and modeling of the weapons' characteristics and their contribution to the battlefield, in particular, the probability of hit ascribed to the weapon. Correlations between weapon types at the tactical level are based on the relative number of the weapon required to kill an opposing weapon. For instance in the attack it may take three antitank weapons of ATGM type to equal one tank, while in the defense one antitank cannon may equal three tanks. Thus the correlation of means may be seen as a test to insure that the force has a proper balance of weapons. The individual means are identified and shown separately in the correlation tables to demonstrate the existence of this balance. The correlation shows that the units possess the necessary ratio of means in each critical category to achieve their mission. Some examples of tactical level correlations of means are the following: A RPG-7 has a value of .3 versus a tank. This means that three RPG-7s can stop a tank and that three will be lost in exchange for a tank. An antitank gun is equatable to two tanks in position. An ATGM is equal to one tank in the defense or three tanks that are on the offense. In this manner standard scores (SUA) for each weapon type and model of weapon have been developed, normalized on a basic model, such as the T-72 tank. The various models of tank in opposing forces can be compared. When it comes to normalizing the different kinds of weapons, such as artillery and tanks, into one numerical score system Soviet writers express reservations. The issue is the validity of factors for comensurability. They insist as a minimum, that such unified scores must not obscure the fact that one weapon can substitute for another only to a limited degree. Such scores are taken as averages for the weapons when employed in the context of an all-arms formation. However, in real combat each battle is a unique and widely differing situation in which average conditions may not exist. In addition to using the scores aggregated by class of weapon, Soviet theoreticians aggregate them for units as a whole to develop composite unit scores. However, these scores are based on much more than a mere addition of all the weapons scores. In fact the research data base for the score ascribed to a U. S. division comprises a small book. The correlations are determined in tanks, artillery, etc. and at higher levels by divisions. The infantry and tanks are the main measures. At the tactical level they count every weapon and use weapon correlation factors to make comparisons. There are multipliers for each weapon and unit. Weapons in the open have one coefficient and if dug in another. At a higher level, the coefficient is applied to division sized units. 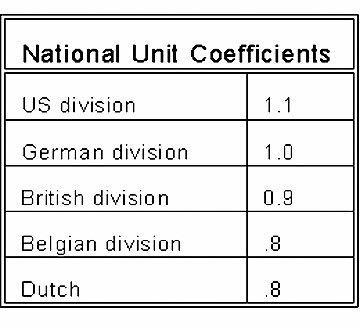 Some of the coefficients for quality used in the 1970s are shown in the following table. The following table shows standard Soviet coefficients for comparing NATO divisions to the Soviet motorized rifle division taken as 1.0. An army in WWII took .1 to .8% losses per day. Now with nuclear weapons losses will be 3.8 to 5.3% per day. For nuclear, during the entire army operation losses will be 27 - 42%. For conventional war losses will be 1.1 to 1.3 % per day. Equipment losses in WWII were 8-9% per day, now for nuclear war losses will be 12-15% per day. For the entire operation tank losses will be 50-80%, APC losses 30-40%, and vehicles 40-60%. Of the total losses in personnel the breakdown is as follows: nuclear casualties 16-18%, conventional weapons 6-7%, chemical wpns 5-6%, biological wpns 1.5-2%, illnesses 1.5-2%. 30% of the total casualties will be caused by the initial nuclear strike. After the correlation is made one can decide if one can accomplish the desired level of destruction "simultaneously" - that is in a single blow. If the correlation shows a deficiency, then one must do it "successively", - that is in a series of sequential strikes. This method would require careful prioritizing of targets. (One of the most noted characteristics of the nuclear strike is that it gives the potential for successful achievement of strategic aims by simultaneous destruction. A successful NATO nuclear strike is expected to destroy up to 30% of WP forces.) However, conventional combat will almost certainly require successive attacks. This is the phenomena which forces the commander to divide the non-nuclear operation into phases and to focus much attention on proper coordination of the use of forces and means. When correlations are performed, they are done on several variants. This typically includes correlations for the entire width and depth of the combat zone, for the entire width and to the depth of the immediate mission, separately on each axis, and for the time at which major changes in the situation are expected to occur such as during enemy counterattacks and during the commitment of the friendly second-echelon. This requires that the commander not only make a static correlation of the forces as they are believed to exist prior to the battle, but also that he calculate a dynamic correlation of the forces that are forecast to exist at the future stages during the battle. The method for doing this is discussed below. (See correlations tables in Chapter Five). As mentioned above, the purpose for calculating the correlation of forces existing between the friendly and enemy forces in the given situation is to use this relationship as a tool in making the decision and planning combat. The calculated correlations are therefore compared with "norms" for correlations considered necessary in various situations to accomplish various kinds of combat missions. An element of judgment enters into the commander's comparison of the actual correlation with the correlations prescribed in the norms. Some Soviet writers indicate that more analysis and modeling of historical combat is needed in order to develop more refined norms that would show the correlation required in various situations or, in reverse, the capabilities that a given correlation might confer on the attacker. In any event the Soviet commander knows that there is a definite relationship between the correlation of forces and the scheme of maneuver and manner for organization of the battle that will be appropriate in the given conditions. If the particular scheme of maneuver is the critical factor and the given correlation indicates that the forces are inadequate, then something must be done to improve the correlation. If the correlation is fixed due to lack of additional forces and means, then the commander must adjust his scheme of maneuver to employ the forces in a manner appropriate to the situation. For instance, having a very favorable force ratio would enable the attacker to strike on multiple axes to split the defender into groups and attempt near simultaneous destruction of all the groups, while simultaneously launching forces into the exploitation to the full depth of the defense. With a smaller advantage the attacker might employ only two major attack axes to conduct converging blows to encircle as much of the defender as possible and then conduct the further offensive as a subsequent operation. With little or no superiority in force ratio the attacker would be limited to concentrating all available forces in one spot in an effort to destroy the enemy piecemeal (sequentially). The correlation of forces is only one of the norms the commander uses as tools during his estimate. Perhaps a more critical one is the norm for density of artillery. (See discussion of artillery fire planning in Chapters 2 and 5). 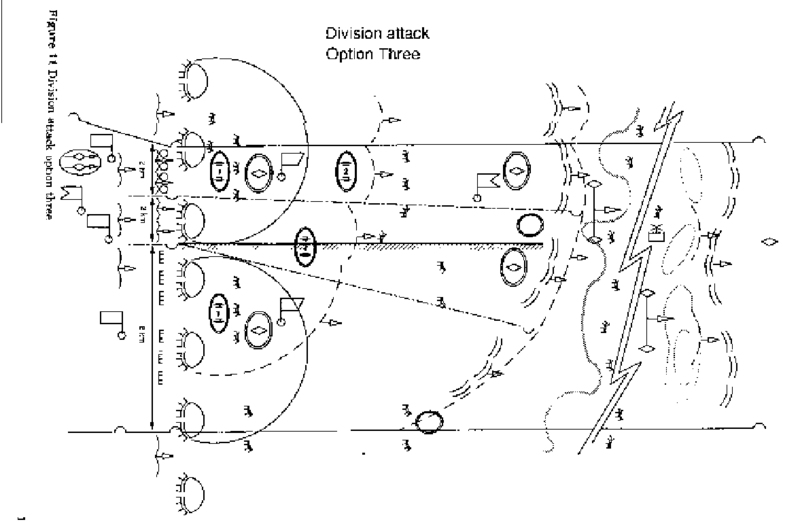 The correlation of forces and norm for artillery per kilometer of breakthrough frontage are applied strictly to the width of the attack zone, which does include a zone on each side from which defending direct fire weapons may hit the attacker. But they do not include forces further on the flanks. The measures match the Soviet echelons against the defending forces to the depth of the corresponding mission. The overall correlation of forces at higher levels such as front just shows if an attack can be made. The detailed correlations are done at lower levels for the widths of the attack sectors. The correlation method shows the areas in which the enemy is strong and weak and is used to help determine the form of the attack, such as penetration here or envelopment there. The specific correlations determine the directions of the main attack and what forces are needed to achieve the desired ratio. Air defense is a special category of combat, which requires a somewhat different kind of correlation. For this the correlation is measured in terms of the percentage of an enemy hypothetical mass strike which can be destroyed by fire during that strike. Individual air defense weapons also have individual kill probability numbers. The Strella 2m has a .3; the 57mm gun had a .25; the ZSU 23-4 had .42. These numbers are based on field tests and experiments. In a conventional war, air superiority for either side is critical. Without air superiority then neither side can win. Soviet planners see that they cannot move their second-echelon forces forward. Air superiority is also essential for attaining air reconnaissance, rear service, etc. One can not operate in a conventional war without air superiority. Therefore the correlation of forces and means for air and air defense is especially vital. The central problem facing the commander when seeking to make a decision is which of the seemingly infinite but actually limited number of possible methods to employ to achieve the mission. By method we mean how to task organize and deploy the forces and means he has and what series of actions to order them to employ. However this problem is complicated by an underlying pre-requisite problem, namely the commander must first decide how (with what staff organization and deployment of decision aids and series of assessment actions) he will go about solving his combat problem. We do not know the decision process Epaminondes used when he developed the revolutionary idea of massing his Theban forces 50 ranks deep on the left of his line instead of the traditional 12 ranks deep on the right of the line, but it is clear that he faced a very simple set of issues compared to those facing the modern commander. To a great extent this underlying issue has been solved for the Soviet commander by development of a highly organized troop control system and procedure. Indeed the purpose of this handbook is to describe what this system is and how the Soviet officer uses it to simplify his decision making problems. In a sense therefore, the entire focus of the organization and processes described here is one of helping the commander make this single (but continuously shifting) decision on how to place and employ his forces and means. (As Clauzwitz said, "In war everything is simple, but the simple is actually very complex". In addition to providing a well practiced decision system, the Soviet army also provides each commander with much assistance in the form of relatively rigid boundary conditions and guidelines in the form of the higher commander's concept of the operation and directives giving clear terrain limits, objectives, timing, location for the main effort, and other requirements. The task remaining for the lower commander then is reduced and limited to how best to maximize the power and effect of his given forces and means to achieve the required goals. The number of reasonable alternate solutions is limited, usually three or four at most and the differences between these alternatives is very small. To illustrate this we can focus on the division level. Determining the liklihood of mission success is one of the most crucial issues facing the commander. During his decision and planning process the commander must not only forcast the liklihood of success of one concept of battle, but also do this using a method which will allow for objective comparisons of the liklihood of success between different possible variants of the plan. Soviet military theorists and writers have proposed various methods for making this forcast. The first issue is to decide on objective criteria for just what result of combat will be labled "success". Three separate criteria have been proposed, which can be evaluated individually. The overall probability of achieving one, two or all three of these measures can then be calculated using simple mathematical rules for aggregating probabilities. The first criteria of success is achievement of the mission, which is generally stated in terms of seizing a specified line or area within a specified time limit. This is considered a vital criterion, so that a low probability in this measure is automatically considered a fatal flaw, no matter how high the probabilities for the other criteria. But simply seizing the required line on time is not a sufficient indicator, because this might be accomplished at such cost that the forces could no longer advance, or might even be extremely vulnerable to counter-attack. Therefor two other measures are added. What is the probability of accomplishing the combat mission; that is reaching a specified line or area in the depth of the enemy position by a certain time? What is the probability that losses can be inflicted on the enemy of no less than ordered, usually (50%)? What level of confidence can be assured that at the moment the troops reach this line they will retain their capability to continue the offensive, that is have losses less than specified (40%)? What is the probability of accomplising a partial or entire success? To determine these answers in the course of comparing and selecting variants of the plan the commander may construct a simple matrix as shown. He then can apply the formula for calculating the aggregate probability for each variant and select from among them. This problem and the calculations going into it are discussed in more detail in Chapter Six. In that chapter are the nomobrams used for determining the relationships between probabilities of achieving required rates of advance and casualties and correlations of forces. The probability of seizing the required line=G. The probability of inflicting required losses on enemy=Y. The probability of having less than maximum friendly losses=B. Result=1, if Y and G and B are all acheived. It is .5 if Y or B is not accomplished, but G is achieved. But it is 0 if G is not achieved, even if both Y and B are. The value for Y (enemy losses) is determined by the ratio of destroyed units or forces etc, to the original totals at the time of a complete halt in combat activities of his command centers and rear area installations. The value for G is the movement of the front line in relation to the original and desired locations. The value for B is the capability of the attacker to continue his advance, which depends on the ratio of the attacker's forces to the defender's, the nature of the enemy operations, and the state of the attacker's supplies. In developing the plan variants the quantitative value of the depth of penetration, the width of the sector of operations of subordinates, the time limits of missions are all determined by higher commander, regulations and experience. But the level of enemy calualties and the desired maintenance of own capabiltiy are stated qualitatively. This method requries the commander first to determine the probability and confidence level that the enemy will suffer losses no less than specified, that his forces will not sustain losses greater than allowable, and that the mission line will be seized. The critical level of losses is that which will negate the force's capability to continue organized combat. Soviet historical studies have shown that in WW II a division was considered destroyed at 50% loss and annihilated at 75% loss. The troops lose their capability to advance and are forced on the defensive, when they have great losses, or to ward off counter-attack of superior enemy and when deficient in supplies to continue. At the tactical level sub-units break off attack when losses relative to start reach 20-40%. Units lose steadiness in defense at 50-60% losses. On this basis and that of various studies a loss of 50% is considered adequate for the enemy and too much for the friendly. The division commander receives an order which specifies the nature of the enemy and terrain, the forces available, the location for starting, the mission in time and space dimensions, and usually where across the width of his zone to apply the maximum pressure with the majority of his forces. He has to decide two main issues. The first is what combat formation to employ. That is, how many forces to place in the first-echelon and how many in the second, and where to locate various supporting elements. And the second is what method to employ in destroying the enemy. That is, what kinds of maneuvers and mix of fire and shock to employ. The first key factor to evaluate is the enemy dispositions in relation to the characteristics of the terrain. He must define as precisely as possible where the enemy forces are positioned and in what strength, and what are their capabilities to shift forces (reserves primarily) during the coming battle. With this information in mind he can examine his alternatives. For this illustration we have shown on the diagrams three possible variations. These are not examples of complete Soviet plan maps, but only sketches to illustrate the points in this discussion. A given condition is that the division will mount its main attack in a four kilometer wide breakthrough sector on its far left flank, in conjunction with the neighboring division, as part of the army main attack. The division commander's first option is to make this attack with two regiments abreast, each using two battalions in its first-echelon; use the third regiment in a holding force attack across the entire rest of the division sector; and keep the fourth regiment in the second-echelon ready to follow the main attack on the left flank. His second option is to spread his center regiment out somewhat, while still participating in the main attack, in order to narrow the frontage for the right flank regiment. This will enable it to conduct a secondary attack. Some the calculations required for making the decisions discussed here are shown with sample problems in Chapter Six. Evaluation of the correlation of forces in the regimental sectors might show that the first option will result in an immediate advance rate of forty-five kilometers per day in the left sector but little advance on the right side until the defenders there are forced to fall back out of fear of being outflanked from their right. The result might be great progress at first, but later the division may have to confront the enemy forces that withdrew from the right, which could slow down the later advance rate. The second option might create a correlation of forces in the main attack sector only sufficient to generate an immediate rate of advance of thirty kilometers per day, but might simultaneously be able to envelop and destroy a large part of the enemy on the right side, thus avoiding facing them later. Another factor that the commander would calculate is the predicted loss rates for the two variations. So far we have just touched on the simple, initial conditions. The more complex and crucial issue comes with the analysis of the expected time, location, and consequences of the intervention of the defender's reserve in counterattack and the attacker's second-echelon regiment(s). For instance, the nature of the terrain might be favorable for the defender so that the first variant might result in such a differential rate of advance on the left and right flanks that the defender would have a prime opportunity to counterattack into the flank of the main attack. Analysis of these options might lead to consideration of a third option, namely to start out as for number one, but as the defender begins his counterattack into the right flank of the main attack regiments, bring the second-echelon regiment forward through the right flank regiment instead of behind the left ones, in order to strike the defender's counterattack in turn in the flank. So far we have discussed only the locations and actions for the four regiments. The division also has artillery and antitank units and others to position correctly. From this simple analysis it is clear that the division commander actually faces a complex problem in making his decision and can use all the analytical support he can obtain. For this he uses the mathematics and norms described in this handbook. He forecasts the answers to such questions as how long will it take for specific forces on either side to move from A to B? How long will it take staffs and units to accomplish various preparatory actions? What will be the ratio of combat power of the sides when they get there? What will those ratios produce in terms of losses and further movement capabilities? What will the contribution of artillery, antitank, antiair, engineers, and other units be? The Soviet staff uses skip-echelon planning, in fact at the division level plans not only take into consideration the regiments but also individual battalions. These are shown on the planning maps. The mission given by army to division states what enemy should be destroyed, where, and by when. When the commander wants to see something done in a certain way he includes this, otherwise he leaves that part of the planning for his subordinate to decide. For instance, if the army plans for a breakthrough attack of a certain width, say 8 kilometers, this will require that two adjacent divisions each weigh their own attacks to have at least 4 kilometers on their interior flanks. The divisions are not given a choice on how to organize their attacks, but told where their regiments will be located so as to create the desired massing effect. Directives from army to division are quite specific. Divisions must destroy a certain enemy by a certain time and seize a certain line. There are plans for an immediate mission, subsequent mission, and a direction of further attack. On a rare occasion against a particularly strong defense it might be necessary for the army to have one axis of say twelve kilometers width. 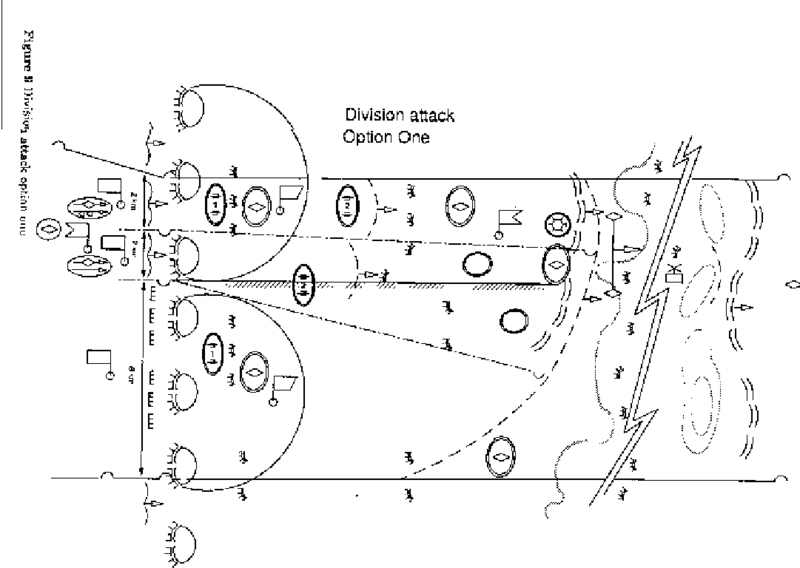 This could be created by placing one division in the center on four kilometers width with no maneuvering room and weighing the attacks of the two flanking divisions on the four kilometer zone to each side, but this would be very unusual. Normally the army uses 2 - 3 divisions to create the main axis and another division to create a secondary attack axis elsewhere. Normally in conventional war the first-echelon division is given immediate and long-range missions, which are executed in one day. The second-echelon division is given usually only an immediate mission and a direction of attack, while it remains in the second-echelon. It is difficult to plan a subsequent mission for the second-echelon division before the start of hostilities. For nuclear war everything is faster. The long-range mission of the division is done by the end of the day, while trying to accomplish one of the following: occupy the entire depth of the defender's division area and seize favorable terrain features to facilitate the next day's advance; maintain a good line on which to repel the enemy corps level counterattack; seize an area from which to secure the commitment of the attacking second-echelon divisions; or seize a mountain pass or river line. There are several forms for the attack. Often tactical airborne (heliborne) forces are utilized to accomplish the long-range mission. The tactical desant by helicopter-born forces is usually the size of a company or battalion. A naval amphibious landing may also be used. The idea is to forestall the defense from using suitable terrain to establish a prepared defense. At this point the division switches to the pursuit mode on a broad front on parallel routes with wide use of tactical helicopters. Its mission changes from seizing ground to destroying forces. Pockets of resistance that are encountered are left to following forces for removal. During the attack, timing is based on coordinating the covering artillery fire with the movement of the combat units to the enemy FEBA positions. The combat forces must arrive at the enemy line just as the artillery fire is completed. If the artillery is planned to fire 40 min, then the question is where should the combat troops be at the start of the 40 minutes in order to arrive on time. They will move forward, gradually deploying from regimental to battalion to company to platoon columns and then into line at predetermined calculated areas. The final deployment is just beyond the defender's small arms range. If there is a covered area that can be reached while the artillery is still firing, combat forces might be able to get as close as 300 meters from the enemy, otherwise the usual distance is about 1 kilometer. (These calculations are in chapter 6). Depending on the form of attack, the artillery may deploy ahead of time in order to complete registration and begin firing before the combat troops move forward. The division plans only consist of the depth for a one day mission. The staff may have some general outline of the next day's plans, if the army commander has informed the division commander, otherwise they will receive their orders later in the day. The staff will develop plans continuously as the attack goes on and data comes in. The combat mission has four elements: (1) Destroy a specified group of enemy; (2) seize a line for favorable conditions; (3) assignment of deadlines for conducting the mission; and (4) how the mission should be executed. Elements (1) and (2) are mandatory while (3) and (4) are usual. During a battle constant changes occur in the situation. The requirements posed by the enemy forces, and the available means to react affect the operations. For example, the division should seize the line of the immediate mission in six to eight hours. The division knows how the mission is progressing if the first-echelon regiments commit their second-echelons when they are at 8-10 km depth and 4-5 hrs into the battle. This gives the division a good idea at H + 4-5 hrs on how the accomplishment of its mission will be doing at H + 6-8. This gives two to three hours for making changes as necessary based on the evaluation of the regiment's progress. The process of acquiring information and making the assessments is continuous and gradual. Once the first-echelon regiments have committed their second-echelons the play of the game is in the hands of the division commander. He has the only remaining uncommitted forces with which to influence the outcome. He must be able to react to the situation (he has the power to react, i.e., his second-echelon). Therefore he has two to three hours to accomplish changes if needed. Meanwhile the division staff is looking ahead to the rest of the day's activities. During the afternoon the staff will begin serious study of the following day's possible missions. Depending if the army instructions arrive early, the division can plan the next day's mission in detail, but this is generally not the case. When first-echelon regiments are about to finish their subsequent missions, they will then be committed to new missions or revert to the second-echelon of the division. (6) Organizing coordination - could be done at same conference for issuing orders or two hours at a second conference. This could also be done on a map or on the ground. (7) Changes requiring new decisions and plans will require at least two to three hours especially if they involve a major regrouping of forces. The combat directive specifies that the attack (movement) is to be ready by ___ time and date. preliminary tactical instructions must be sent to ___(name) at ___ locations by ___ time. The remaining time___ I will hold in reserve. Planning, like battle, is continuous. There are no identifiable separate decision cycles, since everything needs to flow gradually. However, the critical time in a battle is when the commander is about to commit his second-echelon. When the troops are moving to contact the enemy, the artillery will also be moving. The second-echelon unit is more difficult to hit, but also more vulnerable, as it begins to deploy into subunit columns. The Soviets place great emphasis on "securing" the commitment of the second-echelon. The closer to the Soviet planned time of commitment the unit can be attacked by NATO forces the worse off the attacker will be, since that will shorten the time available for the commander to create alternate plans. Another critical time is just prior to the launching of the attack. Again, at this time the first-echelon units will be deploying from large columns into subunit columns. If they are hit far back from the line of commitment, they will have time to implement alternate plans. Rear service targets must also be considered and protected. The regiment will run out of ammunition and POL within a few hours into the offensive. It is expected that the first-echelon division rear service containing the ammunition, medical, and POL supplies will move 3 or 4 times a day, resupplying the forward regiments every 3 or 4 hrs in normal combat. If, however, the regiments were cut off from their rear service, division would be forced to resupply by air. The planned time of attack is critical. The commander must plan a preparation fire to begin countering NATO's artillery thirty to forty minutes before the attacking forces reach the line of commitment. The artillery will move prior to this time in order to concentrate fire. A NATO artillery attack on the advancing units during the final period would cause serious disruption to the attack. The commander emphasizes a last minute concentration and then rapid dispersion during the attack. He must employ all available means for maskirovka. If the defender can trace the movement of the small units and plot ahead of time their movement routes to predict the time and place of an expected attack, then they may be hit at a very vulnerable moment. Frontage of enemy elements that are in the first- and second-echelons, dispositions, layout of the defense, boundaries, flanks, non-occupied areas, location of firing positions of artillery, deployment of reserves (especially tanks); and when, where, and for what purpose they can be used at their line of deployment and directions of their counterattack. Availability and disposition of mass-destruction weapons and the likelihood of their employment. The details for positions down to platoon and company positions with exact locations of individual crew served weapons. Details differ with the depth, but most detail is for the depth of the first-echelon battalion defensive positions, for this platoon level is needed. location of command posts and communication centers radars etc. The division receives situation reports from its regiments every one to two hours. At the same time there are reconnaissance troops forward of the lead regiments. These troops come from battalions, regiments, and the division itself. All of these units are reporting constantly as they move forward. The division staff monitors the radio nets of subordinate units, such as the artillery, engineers, etc. From these conversations bits of information are constantly collected. There are four division radio net systems: (l) the command; (2) the interaction; (3) the warning; and (4) the rear service net systems. The staff logs in all the information received. Every report of an event, is noted and placed on the operations maps. Staff officers keep situation working maps on which everything is marked (by the end of the day the map is hard to read with all the notations on it). All these reports may prompt requests by the division staff for specific bits of information. From the beginning of an operation the time needed to process the data is continuous. When major changes occur in the situation the information is governed by how much time is needed to implement a new decision, such as the commitment of second-echelon to repel a counterattack, etc. The division commander has no direct command over air reconnaissance or other air missions. His request is placed with the air combat control group that is attached to his headquarters. Prior to an operation, the front air army will assign a combat control group to each first-echelon division, which usually operates beside the division operations staff. These teams consists of officers and men with appropriate communications vehicles. The division is the lowest level to which these teams are assigned. The team reports to the division commander with a formal report about the support he has been assigned. This includes the reaction times for various aircraft, their types, capabilities, location of airfields, how many of each are operational, and other data. The report starts with a description of the forces and their status, then continues with suggestions on their uses first in the initial phase and then in the subsequent phases of the operation. The team tells the division commander about reconnaissance resources and procedures for both fixed wing and helicopters. Since the helicopters are closer to the front, their reaction time is shorter, and probably they will be available for direct, "real time" reporting. The division has its own helicopters as well. Fixed wing aircraft take longer to perform reconnaissance. Once over their target, however, they can send direct radio messages about conditions in the area. These reports will be followed by written and photographic reports after the flight. The request for reconnaissance from the division commander goes from the supporting air support group leader to the commander of the supporting air force, with front staff monitoring. The commander of the air force then assigns the mission to a particular unit. the political situation in the area of operations. changes caused by nuclear weapons or by air strikes and artillery. Division plans, like army plans etc., are kept at the command posts. Copies are provided to higher headquarters, but are not sent down to subordinates. The plans are not disseminated. Subordinates learn of their roles and missions through combat orders, instructions, or by visiting headquarters and making notes about their part in the operation directly from the plans or maps. (Samples of all of these are in chapter 5). The plan is based on a specific situation. Any major changes in the situation will require changes in the plan. Once the operation commences, if a new situation that was unexpected by the division staff occurs, then they must review the plan and change it to coincide with the situation. For instance, the enemy was able to mobilize more forces sooner than expected. This will change the correlation of forces in some area and require changes in their dispositions. The time to process information varies also. If the enemy is moving, the staff first calculates the time of arrival and the probable intentions of the enemy force. It then calculates how this arrival will change the situation and what will be necessary to defeat the enemy's action. This calculation would give the time available for planning and execution. If there is not enough time to give a desirable plan then some other response will be tried, however, only adjustments that are possible will be attempted. (These calculations are shown in chapter 6). The commander will ask the reconnaissance officer to obtain information dependent on the time available. The reconnaissance officer will then try to obtain the best information he can in the given time. He will then report not only that information, but also his own assessment of the situation based on the total of all the information he has received. The length of time to obtain information depends on the type that is needed. For instance it might take two hours to obtain a response to a request for aerial reconnaissance, if the aircraft is not already in the air. However, if the aircraft is already in flight it might take only thirty to forty minutes. In general, requests for information are to confirm bits of intelligence that have been received. Matching information from several sources to confirm an enemy's rear areas might take one to two hours, but if it is beyond the division's immediate area, it could take longer. The commander will not wait for the information when making his decision, if there is no time. He will use the best information he has available and make a decision at the proper time, then continuously adjust it, if necessary, as new information comes in. The commander will not sit by until he has "perfect" information on which to base his decision, the initial data he receives will support a fairly accurate decision. All data received after that is used to adjust the original decision. The Soviets expect things to change during the course of a combat situation. The staff continuously monitors the situation and reports the new information as it is received. After a few hours into the situation the commander may decide that his initial plan is no longer applicable and will make the necessary changes to the plan. The time this may occur cannot be specified in a single number. Specific scenarios might be developed to estimate the length of time a Soviet staff might need to react to concrete examples of sudden changes, such as nuclear strikes or unexpected strikes on the second-echelon. In general, it should be realized that most changes in a combat situation are gradual and continuous. The recognition that change is actually necessary requires an unusual new reaction on the part of the commander and is a gradual perception rather than a sudden revelation. The original plan developed in peacetime will have attempted to foresee all possible contingencies and to allow sufficient flexibility in execution to accommodate unforeseeable situations. The actual plan as amended will have accounted for some of the previously unforseen contingencies. It will allow for the possibility of further changes during execution as the situation develops. Events that might disrupt a division in an attack might include a strike on the second echelon-regiment that is moving toward its planned commitment line. If, for instance, such a strike came two hours prior to the planned time of commitment, then the Soviet commander would do a series of calculations based on the dynamic nature of the battle to try and foresee what the successive and cumulative changes would be because of the delay to his second-echelon regiment in relation to the movement of the enemy's reserves. This analysis would hinge on a comparison of the time and space factors for the various forces moving on the battlefield. The echelon system is designed this way on purpose to give the commander this flexibility. A regiment should be able to accomplish its immediate mission of 8-10 km depth in 4-5 hrs or a subsequent mission of 16-20 km depth in 6-8 hrs. If the second-echelon regiment is knocked out after one hour into the battle, then division should change the first-echelon regiments' subsequent missions, even though the immediate mission was accomplished, due to the lack of support from the second-echelon regiment. With no support from the second-echelon it might take the first-echelon more than 6-8 hrs to proceed on their own, possibly taking as much as 12 hrs to accomplish the division mission. The question will be, what changes will occur during this time due to the projected actions of the enemy forces moving in counterattacks from their current locations. The time to acquire information during a battle depends on what information is received. It takes no time to confirm the presence of a defending first-echelon battalion, but to confirm the locations of the defenders' deeper reserves takes a little more time. Within an hour of the start of reconnaissance the attacking force should know the exact location of all the enemy first-echelon platoon firing points. Locating the enemy's division reserves might require four to five hours. Even though the FEBA is under direct observation by observation posts, etc., deep locations such as the division reserves require aerial reconnaissance, EW, deep patrols, or information from higher headquarters. nuclear weapons are used or there are heavy air strikes. The division commander and staff calculate the ratios of tanks and antitank weapons at each location on the battlefield. These calculations (which include the application of appropriate factors) are used to allocate forces, shift reserves, add more ATGM weapons, etc. Everything is calculated in terms of time and space, with the times for forces of both sides to move to the projected areas of confrontation carefully evaluated. If the current projection shows a lack of necessary forces within a given number of hours, then changes must be considered. It is important to note that, if the Soviet staff is doing its job, they will not need to make a decision in response to something that has suddenly happened. Rather, they will make changes due to their forecast (projection) that something previously unplanned is about to happen. The division commander and staff are continually updating the projected correlation of forces expected to occur at various phase lines, such as the planned commitment of the second-echelon and the various expected lines for an enemy counterattack. If something unfavorable is foreseen, immediate steps will be taken to alter the correlation by changing the plan in the least disruptive way. These new predictions will be passed to the commander. According to most norms, a three to one ratio will be required for the attacking forces at the critical phase lines. If this ratio is down to two to one during part of the battle or on part of the field, it may still be acceptable. However anything below a projected two to one ratio will trigger some sort of revision. the limitations imposed by higher headquarters (such as how something must be done or the posture forces are supposed to be in at a certain time and place in order to fulfill the higher headquarters' concept of the operation). overwhelm the enemy at the start of the actual attack by striking first. Thus, the meeting engagement is a matter of speed and rapid reaction. The defender will be at a disadvantage during this meeting engagement, between his counterattacking forces and the attacker's second-echelon. The defender's artillery is to far too the rear. The attacker has his artillery close and under better control. The commander must recognize that at the moment of an initial contact a large fraction of his artillery will be on the march and not deployed for fire. The defender's artillery on the other hand will be deployed. The only solution to this is for the attacker's artillery to deploy immediately in place, regardless of the suitability of the terrain and begin fire under decentralized command, by battery if necessary. After the situation stabilizes the regimental and division artillery groups will be reestablished. If the second-echelon unit is hit prior to its full deployment, it will be supported by all available artillery from the adjacent first-echelon units. If the first-echelon units accomplish their initial missions and are advancing when it becomes apparent that the second-echelon regiment is delayed and will not arrive in time to take on the defender`s reserves according to plan, the first-echelon would continue to move forward and engage the reserves while trying to create favorable conditions for the commitment of the second-echelon when it does arrive. The question of tactical versus operational disruption and the methods to counter it is very complicated and difficult to explain or compare. For example, at the army level the scope of operations in time and space is so large that there are reserves available to overcome local failures. If an entire division is knocked out of combat and the army plan is disrupted, there are reserves and special assets that the front might use to overcome the adversity. In general, the Soviet idea is to do something to prevent the defender from exploiting the situation with a successful counterattack. This will usually mean delaying his counterattacking forces as they move forward. Inserting an airborne force in front of them to cause a delay might be one way. Large air strikes might also be used. This idea would be used to prevent an adverse change in the correlation of forces at the front line. If one division is hit, perhaps an adjacent division may maneuver to secure a line to facilitate the recovery of the first division. One cannot consider one division without considering the entire army and in turn the front as well. Soviet units will not hesitate to call on higher headquarters for assistance. The correlation of forces is calculated continuously during the battle for several different sets of forces: (1) along the entire division front; (2) for each regimental front; and (3) along projected lines for expected counterattacks and for commitment of the second-echelon. Calculations are made for various depths on each line, such as depth of the enemy's first-echelon brigade, the enemy's division reserves, the entire depth of the attacking division's mission, and regimental axes at various depths. These calculations are used for predicting future outcomes and to alert the staff to an impending crisis in time to take steps to overcome adversity by maneuvering forces and fire power. The relation of rear services to the unit's missions is another important consideration. The norm is for the first-echelon of the division's rear service to move frequently. The second-echelon of the division's rear service moves only 1 or 2 times a day. The division's rear service can deliver supplies to the battalions, gun positions or to the regiment's rear service. Delivery directly to battalions occurs more frequently prior to an operation. In general, when the first-echelon battalions have achieved their immediate mission they are resupplied by the regiment. The regiment is then replenished by the division. By the time the regiment achieves its immediate mission (that is the subsequent mission of the first-echelon battalions) the process is repeated, i.e., regiment resupplies the battalion and division replenishes the regiment. Consumption of ammunition should decrease for the remainder of the day but POL might increase. When the regiment accomplishes its subsequent mission for the day only one more resupply from division will be needed (i.e., near the end of the day). However, during the course of day the rear service will start being used for evacuating casualties as the division aid stations and medical battalions start to fill up requiring evacuation to the army hospital. The maskirovka (deception and concealment) plan is one of five documents under the general heading of combat support. After the operations directorate has a basic plan, a maskirovka plan is prepared to insure coordination of deception measures. The maskirovka plan is strictly subordinate to the mission and dependent on it. In addition to the operations directorate the engineer, chemical, signal, and radio electronic warfare directorates play a role in developing a maskirovka plan. The instructions for a mission issued by a commander to his subordinates might include some instruction on maskirovka along with the other support topics. Basic measures to be taken and what forces will be employed in executing this plan may be specified. In this respect the most critical period is during the concentration of forces prior to the attack. In an estimate of the situation the subject of maskirovka would most likely enter into the study when considering the effect the terrain would have on concealment and what conditions might enhance this. This would include decisions to move at night and the development of engineer measures. The Soviet dictionary of basic military terms states that this means attack position. "An area of terrain allocated to troops for occupation by them prior to going over to the attack from a position of close contact with the enemy. An attack position is prepared in accordance with the concept of the operation and the operational formation of the attacking troops and is organized in the engineering sense so as to conceal their presence, to facilitate their deployment and transition to the attack, and to protect them from all weapons at the enemy's disposal." The term today really means a starting position, that is: the position from which the troops move out, whatever their type of movement or march. It might be located near or far from the enemy depending on the method for initiation of combat. In this definition the Iskhodnyy Rayon may or may not also be a Vyzhidatel'nyy Rayon. The dictionary states that it is "an area of terrain occupied by troops before going over to the offensive. All measures associated with preparation for the offensive are taken in the assembly area. An assembly area must provide good conditions for concealment against ground, air and radar observation by the enemy, and must afford the troops protection against weapons of mass-destruction." The term refers to the "forming-up area or FUP" which is a "waiting area" which is the final area in which troops wait prior to commitment to combat. It is the area typically associated with the final waiting area occupied by a first-echelon unit prior to combat, if such an area is occupied at all. The preferred method now is for the unit to enter combat straight from the approach march, in which case no final forming-up area is occupied. It may also be the final waiting area of a second-echelon company, battalion or regiment in which the unit is formed in company columns and in which it makes final preparations while awaiting the first-echelon unit to accomplish its mission. However, in general this area is not always designated in any special terms. In fact, during the course of an operation the units are generally on the move, even second-echelon units, and therefore do not "occupy" areas, but rather just stop periodically in their battalion or company columns. The second-echelon regiment will be deployed into battalion columns, which may or may not be further deployed into company columns at this stage of the advance. The last assembly area "occupied" by the unit may be the concentration area. The military dictionary does not define this term, however sosredotocheniye means concentration. This area is the concentration area located in the depth of the forces' own area in which a unit concentrates while receiving a further mission. 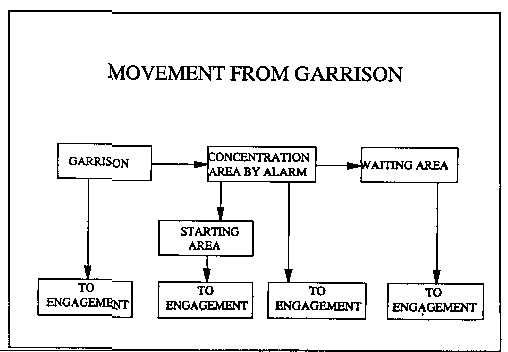 It may be the area near the garrison to which a unit moves on alert or the area in which a unit assembles after a rail movement. The dictionary defines the term as "alternate region or position" "A zone or sector of the terrain prepared or designated for the disposition of troops or for defense. It is used for changing the grouping of troops with a view to withdrawing them from the area of an enemy nuclear strike, or for attaining greater stability in a defense." The general sequence of occupation of these areas is illustrated in Figure 3. The sequence depends on the method for initiation of combat. The methods for initiation of combat are shown in chart 2. It formerly was Soviet practice to move from garrison to a concentration area, then to move forward and occupy a forming up area. In recent years Soviet practice includes movement into combat straight from the march from concentration areas in the deep rear or even directly from garrison. Now the Soviet practice is to initiate combat always from the line of march unless that is not possible. Reznichenko states that it is now too dangerous to concentrate troops due to the much greater capabilities of the defender for maneuver and fire. He specifically mentions not only nuclear, but also conventional artillery and especially "smart" weapons, which the Soviets call reconnaissance-strike complexes. The Soviet force when deployed for combat but waiting in a second-echelon for commitment to battle attempts to remain outside the range of certain classes of enemy weapon systems rather than enemy units per se. While the first-echelon battalion is achieving its initial mission, the second-echelon battalion of the first-echelon regiment will be in an area located just out of range of the defender's antitank guided rockets, direct fire artillery, tank guns, and some of the indirect fire artillery. While the first-echelon regiment is accomplishing its initial mission the second-echelon regiment remains in an area outside the defender's artillery fire. The second-echelon division will be located outside the range of the defender's tactical nuclear artillery and rockets. A second-echelon army could be many hundreds of kilometers from the front line on D-Day, and will move forward in order to be 200-300 km from the current FEBA when it is 2 days away from planned commitment. While the first-echelon battalion is accomplishing its immediate and subsequent missions, that is the regiment's immediate mission, the second-echelon battalion of the first-echelon regiment will be located in an area about 30 minutes from its line of commitment. The area is 6-8 km from the FEBA and the battalion may be there for 2-3 hrs, which is the time it takes the first-echelon battalion to accomplish the immediate mission. (This is the time and distance associated with the new and deeper Soviet depth of initial mission. Of course the second-echelon battalion may shift around from one location to another during this period. Since the battalion is already organized into company columns it is difficult to say that it "occupies" the area. During the 6-8 hrs it takes the first-echelon regiment to accomplish its immediate and subsequent missions, that is the division immediate mission, the second-echelon regiment is waiting 10-12 km from the moving FEBA and not more than 1 hr travel time from its planned line of commitment. It is deployed into battalion columns and does not occupy an area. If the method for initiation of combat is from the march, the first-echelon division will itself be fifty to sixty kilometers away from the enemy positions prior to the start of its final approach march. The first-echelon, like the second, will attempt to remain outside the range of the enemy tactical nuclear rockets, artillery, and ground reconnaissance while it is preparing for combat, especially during the period prior to the initiation of hostilities. The second-echelon division is located less than an overnight march away from its line of commitment just prior to commitment. This used to be 40-60 km but now could be as much as 120 km from the location of the current FEBA. The distance is based on the concept of making the final approach in a twelve hour period at night with the final six hours being needed for deployment into combat. During preceding days it may be much further away. However the governing consideration for the distance of the second-echelon division from the front line will not be the time it takes to travel the intervening distance but rather the requirement to be within the army's assigned area. Since the army rear boundary is only 120 km from the FEBA the division would be expected to be within this. The division could be 200-300 km away until 24 hrs prior to commitment if it was from front or another army and was just joining the first-echelon army. By that time (the final 24 hrs) it has moved to within 120 km away and into an assembly area in which it has been task organized. There is not a single time line used in all situations. The decision is given to the second-echelon units at the same time it is given to first-echelon. Therefore the two echelons will have differing times between receiving orders and commitment into combat. The second-echelon has very much more time to prepare. As the combat situation develops decisions will be adjusted constantly in a continuous process. Therefore some units will receive orders quite close to their commitment times. Some units may move into waiting areas and some may not. The criteria for distance of waiting areas from the FEBA are given in both the classified 1966 and the unclassified 1984 versions of Reznichenko's Tactics. The principal factor governing location and size of assembly areas of whatever type is the requirements of the task to be performed by the unit. Conducting war is a matter of taking risks, therefore whatever risks are unavoidable will be taken to accomplish the mission. If the unit is close there is the risk that it will be subjected to more attrition from fire strikes. Among the other considerations which must be taken into account are the tactical risks involved in being too far. If the unit is too far from the combat area it has increased risk of being late to arrive. The further away it is the longer it will be subjected to attrition producing attacks from enemy air and artillery while on the final march. There are norms for the size of battalion, regiment, and division assembly areas of the FUP (see previous section on Assembly Areas) type. However there are no such standards for concentration areas. The unit in a concentration area is not tactically deployed but administratively deployed even in wartime. Therefore in the concentration area the entire division may not be in a single area. The regiment and battalion may be located along rail lines, in a long rectangular form or it may be in a oval form concealed in a woods etc. The point is that since it is not about to perform some tactical mission in which readiness time is a key factor it does not need to be concentrated in a tactically disposed manner. "While guided by this principle [concentration] it should be borne in mind that in modern combat there exists a constant threat of the employment of nuclear weapons by the enemy. This gives rise to the need to disperse troops and adopt measures aimed at reducing losses when the enemy launches nuclear strikes. For this reason, the need to disperse personnel and equipment should be taken into consideration when massing them. The degree of dispersion depends on the tasks to be performed, the distance separating friendly forces from the enemy, the protective features of the terrain, and the capabilities of command and control assets. It must provide for the timely concentration of efforts and rapid dispersal of personnel and equipment along the front and in depth after the combat task has been performed." The Soviet view is that there is a dialectical conflict between the pro's and con's of each factor. The principle of dispersion conflicts with the requirements for adequate command and control, the task to be performed, the limitations on the size of unit area set by higher headquarters, the capabilities for logistic support, the terrain requirements, and the nature of the enemy threat. The Soviet combat arms (motorized rifle or tank) battalion in a FUP (waiting) area is dispersed in a rectangular area about 2 by 3 km or up to 6 sq. This size allows the battalion to keep together so that when the battalion is ordered to move forward it can establish the columns in thirty minutes. If the battalion were dispersed over a greater distance, then whenever it was to move it would take more time to reassemble and form up. This in turn would effect the regiment's move and require regroupment prior to commitment to combat or deployment into a meeting engagement. Such delay might allow the enemy to outmaneuver the Soviet unit or overtake it (preempt it) in reaching critical locations. The Soviet battalion in this waiting area is actually formed into separate company columns. The companies do not disperse, but remain in company column of vehicles while the personnel disperse to some degree around their vehicles. There is no norm for the space between the companies. The space between vehicles is ten meters. The internal communications means within the battalion and its other administrative support means for tactical coordination require that the battalion should be in an area of not more that three to four kilometers from one flank to the other. Further dispersal would increase the time spent in conveying messages and reduce unit cohesion. There are four maneuver battalions, one antitank battery and one artillery battalion in a regiment. All the remaining combat units are grouped around the regimental headquarters. In addition the regimental rear service base will be established in another battalion sized area in the regimental area. This makes eight assembly areas for the regiment. With the battalions each in 6 sq km and with 3 km between each battalion sized unit the regiment occupies an area of 90-150 sq km. At the division level there are four maneuver regiments plus the artillery regiment, rocket battalion, antitank battalion, reconnaissance battalion, and independent tank battalion. The signal battalion, engineer battalion and other combat support units are generally dispersed and attached into the combat units. The division rear also has several battalion sized installations for medical, transport, supply, maintenance and support activities. The division occupies an area of 500-600 sq km when in a forward FUP or waiting area or when deployed in the first-echelon on a frontage of 20 km by depth of 30 km. The Soviet main effort for unit dispersal for protection against enemy weapons is the space between battalions. This distance is now three to kw to five kilometers. Formerly it was two to three kilometers. This is the security measure against enemy tactical nuclear rockets and is established on the basis of enemy five and ten ks warheads. The idea is that one warhead can destroy no more than one Soviet battalion. The same three to five kilometer space is established between battalions on the march. This is also the standard norm for distance between battalions in defensive positions. It must be recognized that division concentration areas in which they form either directly from garrison or after moving forward into the theater of operations, but which are still deep in the rear, can be very large, perhaps 1,000-2,000 sq km if one counts the area of the spaces between the regiments. It would be most likely that the division's regiments would be located in entirely separate areas, since they are moving from separated garrison locations. It is not until the division moves forward into the combat zone that it is concentrated into its tactically organized structure. There is no standard size for the division when so far to the rear. Some divisions may be concentrated in areas no larger than when at the front, 500-600 sq km. The battalion area has already expanded to the maximum feasible for current technical signal means and tactical concepts. Therefore it will be difficult to expand it in response to the advent of smart, deep attack weapons, in the NATO arsenal. With improved communications means the battalion possibly might be expanded by 1 km to 3 by 4. The distances between battalions might be expanded somewhat, say to four to five kilometers. However at those distances the regiment would have a frontage of 10 km and the division would occupy an area of 25 by 30. This would require an additional one hour for the regiment and two hours for the division to concentrate to move forward. This might be acceptable during the initial phase of war, prior to the actual start of hostilities, but during combat even 30 minutes can be crucial. With the division assembly areas spread over the entire width of the division sector concentration for a breakthrough would be more time consuming as well. A better possible solution would be to keep the distances the same and provide additional preparation of the positions to protect the troops. Soviet theory insists on and stresses protection for the troops from enemy weapons of mass-destruction in assembly areas. The deep attack weapons are classified by the Soviets as mass-destruction weapons. Soviet engineers might manage to create prefabricated materials for use as rapidly constructed shelters in these areas. Another option would be to occupy the areas earlier and stay longer in order to have time to create adequate protection. Soviet norms give six hours as the time needed to prepare adequate protection. Or the areas might be occupied later and for shorter times with periodic shifts in area to reduce the likelihood of detection and targeting. The difference between a second-echelon and a reserve is a second-echelon unit receives its specific mission from the initial plan, knows its objective, line of commitment, direction of attack, and timing. The reserve does not receive such a mission from the initial plan. The second-echelon mission can be used to continue the attack, to reinforce a mission, to prevent a counterattack, etc. The reserve is used for unforseen missions. The second-echelon is usually one-quarter or one-third of a force, while a reserve is one ninth or perhaps one sixth of a force. Generally there cannot be a second-echelon and a combined-arms reserve at the same time except under certain circumstances. The second-echelon follows the first-echelon closely and is ready for commitment at a designated line. It moves in pre-combat formation. The reserve moves from assembly area to assembly area, not in pre-combat formation. According to the latest tactics, a battalion now attacks in one echelon with a reserve of one platoon. For formations (up to a division) during an operation a second-echelon can be committed however, a new second-echelon cannot be recreated. For those circumstances a reserve is often established. A regiment can have one company in reserve while a division reserve will consist of one or two battalions. A reserve receives its mission just before commitment. A unit may have a second-echelon and reserve such as in mountains where the second-echelon is on the main axis and a reserve is on the supporting axis. A reserve may also be provided for rear area security and to keep LOC open. movement of the enemy reserve - variations from the planned amount of delay that is to be accomplished, such as destruction of bridges and routes. The variations examine different situations that will occur if the reserve arrives at different times. For instance, it may be planned to hit a reserve en route with fighter bomber strikes and inflict a 10-15% casualty creating a delay of 30 minutes (this is the standard norm for the effect of a fighter bomber squadron against a battalion on the march). Just in case the flights may not succeed and the enemy arrives first at the original line of commitment, a plan must be established for a second line of commitment to be used. The effect of enemy scattered mines, nuclear weapons, rockets, and chemical weapons are all variations to be evaluated. Use of airborne landing and air assault landing forces by the enemy at different places and times must be considered. If the line of communication is destroyed by an enemy action and a reserve cannot arrive at its line of commitment on time (for instance on the second day of the offensive when it might be planned for a division to have moved from 400 km in the rear), what would the consequences be? What would happen if the local population took up arms or if they jammed the roads? The first-echelon's and the enemy's reactions. If the first-echelon is successful and is advancing better and/or faster than planned then the division will hold the second-echelon and commit it at a later time. There would be no reason to endanger the second-echelon to casualties or giving up the flexibility in holding it uncommitted if the first-echelon can run the gambit alone. If the first-echelon is moving fast and has opened up a new axis, then it might be advisable to commit the second-echelon to this new area. If the first-echelon is unsuccessful, then division might have to commit the second-echelon early to retrieve the situation. If the enemy defenses are weaker, then commitment of the second-echelon would be at a later time. If the results of artillery and air are more devastating to the defender than expected, then commitment of the second-echelon will be later. If a nuclear strike destroys the enemy, keep the second-echelon uncommitted but kept moving forward in columns. Before describing the issues and factors included in the front commander's decision on deployment into echelons it is well to review the Soviet concept of echeloning to examine the purpose Soviet theoreticians and commanders have in mind in structuring a force into multiple echelons. "the simultaneous suppression of the enemy defense by attrition throughout its whole depth, by breakthrough of the tactical zone of defense on selected axes, with the subsequent rapid development of tactical success into operational success by means of committing to the engagement exploitation echelons and the landing of air assaults for the most rapid attainment of the set aim." The group of decisions on how, when, and where to commit the first- and second-echelon armies is actually the essence of the decision for the operation itself. Commitment of the first-echelon is the basic action which initiates the operation as a whole. It is designed to accomplish the initial mission which itself is the critically important phase of the action. The use of a second-echelon army is related to the enemy defense. It is expected to counter and overcome enemy strategic reserves found in his deep rear areas about the 6th day of the operation. Changes on the enemy disposition or introduction of fresh strategic reserves would alter the specifics of its actions but not the role of the second-echelon. The Soviet concept of the second-echelon is that it is a force created and committed to increase the momentum of attack in its subsequent phases. The use of second-echelons is entirely related to the structure of the enemy defense. Friendly front composition, attachments and support, adjacent units etc. Additional information on the enemy and friendly resources and the environmental conditions is available in the headquarters database. On the basis of this information the commander first "Clarifies the mission", the Soviet term for the thought process in which the commander gains a full understanding and appreciation of the overall situation and his place in it. In this process the commander thoroughly analyzes the senior commander's "Concept of the operation". This gives him a clear idea of what must be done. He determines two things: the role that the front will play in achieving this concept and the scope of the mission in depth, width and timing. From this he makes a deduction in which he determines the best way to accomplish the mission, in other words HOW it must be done. This determination includes deciding on the direction of the main and other attacks, (the general direction of the main attack will be specified in the received directive), the operational echelonment to employ and the groupings of the armies. The decision on operational echelonment and grouping establishes first of all how many echelons are required and then how many and which armies will be in the first-echelon and how many and which in the second-echelon. The basis for this decision is the commander's calculation of the depth and width of the front mission, the time to achieve these and the required rate of advance, (all of which are specified in the received directive). This information is matched against the general layout and nature of the enemy's defense system and his intentions and capabilities. From these calculations he derives his general idea of the number of armies required and their echelonment and formation. It is clear that the front commander's "decision" is actually preordained in large measure by the content of the directive he receives from his superior. The higher commander and staff are planning the overall strategic operation on the basis of the same information and conception of the nature of combat as held by the front commander. In their calculations they will have already determined that the front has the necessary resources to accomplish the mission and will in fact have designed and assigned it on that basis. The front commander's major influence is felt in his development of details such as the selection of which armies will be in each echelon and where exactly their army boundaries will be and when exactly they will accomplish the many steps required to initiate combat. A. Need The requirement for structuring the force into echelons is the first issue. The basic issue is should the force be deployed in one or two echelons. This means in practice, "is a second-echelon needed or not?" Otherwise the forces will all be deployed in the first and only echelon. The nature of the combat grouping is a fundamental consideration which in turn affects all other issues. B. Size The size of the first-echelon, that is the number of armies that will be required to accomplish the mission is the next issue to be addressed. How large the first- and second-echelons should be to accomplish their missions is fundamental. This inevitably results in an assessment of trade offs since ideally both echelons should be as large as possible. A study of this question will have been done in peacetime by the general staff when it determined the number of armies to assign to the front. The decision involves a number of mathematical calculations. (Discussed in Chapter 4). C. Composition The allocation of front assets in terms of the number of divisions and other units assigned to each army and the distribution of artillery and air to each army must be addressed. Which actual units will be assigned to each army is also decided. Mathematical calculations and analysis are required for all of these issues. D. Location The armies must be assigned specific sectors in accordance with an overall scheme of maneuver designed to achieve the objectives set for the front operation. The locations for assembly areas, starting areas, lines of commitment, lines for intermediate and subsequent missions and other actions must be established. These too require calculations. E. Timing The exact time for starting and accomplishing each mission and for occupying each location must be specified. F. Security The entire force must be secured against enemy air and ground attack at each stage of its activities, especially when in assembly areas, on the march and at the time of commitment into combat. G. Deception The organization and movement of first-echelon units should be done in such a way as to enhance the effectiveness of the overall deception plan. H. Support The Soviet conception of support is very specific. It includes protection against weapons of mass-destruction, engineer, chemical, reconnaissance, deception, hydrometeorological and topogeodetic support; all of which must be carefully coordinated. I. Coordination The requirement for coordinating the combat actions of all elements to insure maximum total effectiveness must be considered in making the decision on establishing echelons. A. Nature of the war The war will be conducted under the threat of the use of nuclear weapons in any case, but if it is planned to begin with an "initial nuclear strike" rather than with the use only of conventional weapons the use of first- and second-echelon armies will be quite different. Changes in roles will affect the specific responses given to each of the issues listed above. B. Timing of the war - Mobilization versus surprise If the war will begin suddenly with relatively little prior buildup instead of after a long period of increasing tension will make a major difference in the requirement for first- and second-echelon forces. It may be that the necessity for exploiting surprise in a sudden war dictates that all available forces be committed in the first-echelon, with none either available or needed for a second-echelon. C. The aim and concept of the strategic operation This will be the governing consideration for the front commander as he "clarifies his mission" and then makes his decisions. Of course the higher commander will have already considered the nature and timing of the war in his own decision which is passed to front in terms of a directive. D. The role and place of the front This governs the specific content of the front plan, which in turn establishes the tasks to be assigned to first- and second-echelons. It too will be prescribed by the higher commander. E. The front missions The commitment of first- and second-echelon armies are tied to the immediate and subsequent missions given the front in the directive from higher headquarters. Hence this factor will determine the location and timing of these commitments. F. The nature of the enemy defense The offensive plan is closely related to the nature of the defense. If the enemy is planned to be engaged in a meeting engagement the formation will be quite different from that required for a breakthrough operation of prepared positions. Furthermore the size and strength of the enemy force influences the location and structure of the attacker's forces. The depth of defense and size of reserves is a critical element influencing the creation of a second-echelon. G. Location, dimensions of assigned area, and nature of terrain All these factors influence the decision on organizing the first- and second-echelons. H. The status of the enemy and friendly forces The correlation of forces is an important tool used in deciding on the nature of the offensive plan. The view the Soviets have for war in the future includes the potential dangers and possible problems the Warsaw Pact could create. These problems are so great they feel they must win a war quickly or things might go from bad to worse. They need a quick solution as they are not assured of the loyalty of the Warsaw Pact peoples. If they cannot win a non-nuclear war quickly they expect to use nuclear weapons. The Soviets do discuss a conventional war, but even in this case they insist that a plan for nuclear war be ready because the war could become nuclear at any time. During a conventional phase the forces must not only be constantly ready to go nuclear but also be deployed in a posture capable of absorbing a nuclear strike. A nuclear war if started initially, or whenever launched, would have a strategic strike conducted by strategic forces, not the fronts, which means it will come from submarines, long-range aviation, strategic rocket forces and space weapons. This will be followed by an operational/tactical strike conducted by the fronts. The operational strike will be as close to being simultaneous as possible, but a strategic strike will inevitably come first. This is because the strategic weapons are always at a higher state of readiness and can be launched quicker. Because of the need to preserve secrecy, the fronts will not be notified ahead of time. Moreover, if they did notify front headquarters, the operational weapons would have to be setup for firing, which may be seen easily, giving away secrecy. Also, the targets of the strategic strike are deeper and more fixed. The targets of operational weapons are mobile and the weapons used would need time to setup. Therefore operational weapons would follow trying to minimize the gap. The demarcation line between strategic and operational targets was about 250 km deep in the 1970s and is most likely deeper now. The Soviet authorities define activities of divisions and below as tactics, of armies and fronts as operations, and above the front as strategic. The theater is controlled by the general staff. The strategic forces may be allocated in part to the theater and military districts. The plan of war is made at the general staff level and only a few selected people participate in it. They plan all the strategic operations. Even the Warsaw Pact countries do not know the entire plan. The general staff decides on contingencies and makes plans for them ahead of time. The concept of preparation of a TVD for war includes the provisions that all economic plans must be coordinated and approved by the military to insure that all economic activity furthers this preparation. For nuclear planning the front generally has 400-500 aircraft plus rockets available which gives it about 250-300 nuclear delivery means for an initial strike. This is enough fire power to knock out 10 divisions, all command posts within the division, air headquarters, all nuclear delivery means, and tactical aircraft, etc. No matter how the war may start it is planned as if nuclear weapons will be used. During peacetime weapons are preselected and areas are planned for concentration of these weapons. The missions for different units and the targets to be hit are also selected. They assume the areas of concentration for the NATO units. These target plans are made and sealed and already in the safe. For mobile targets specific categories and priorities are planned, but the details are worked out after the envelope is opened. There are two types of envelopes passed down to the regiment level. One has a red ribbon and one a blue. On declaration of combat readiness # 2 they open the blue envelope, and at full combat readiness #1 they open the red. These envelopes contain other envelopes for later reading on signal. The front envelope is not at army headquarters. It is worked out with the army's help and sealed elsewhere. the plan of operation during actual war. Reconnaissance has wide direction. Whatever information anyone has is sent to higher and lower headquarters. Each commander has an EEI and a directive on reconnaissance that specifies times to report. Reconnaissance assets are allocated by priority, with most of the higher categories of targets being in the enemy command and control area. The nuclear fire plan is drawn up by the operations directorate, the chief of rocket troops and artillery, and the chief of staff of the air army, under the direct supervision of the front chief of staff. According to calculations, all aircraft should be in the air during a nuclear strike period. Once the aircraft leave their airfields the element of surprise is gone. Launching the fighter aircraft may create a problem, since they are needed to repel the enemy massive air strike. This requires much careful planning. In a nuclear strike the critical priority on the first strike is speed, on the second strike the priority is accuracy, so detailed reconnaissance is not as important for the initial strike. The strategic strike may be launched before or after the front has deployed. If the decision to strike is made at this stage, the gap between the strategic and operational strikes may be closed easily. However the front also has a deadline to use its weapons in the given plan as they become ready and as targets are located. 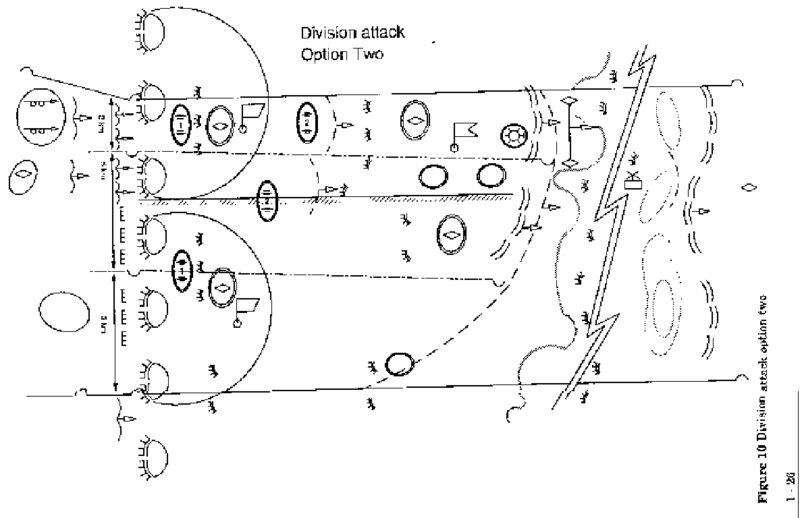 In this case the front does not launch one massive strike, but follows the strategic strike with a series of weapons being fired. If the front is deployed, it can use all its weapons at once. The role of the front strike is secondary to the strategic strike in any case. If the front does not have one part in support of the strategic strike, then they use their weapons when they are ready. Control of escalation is a major problem. The manuals reject all ideas of limited use of nuclear weapons.